Soft drink companies would rather talk about exercise than sugar. You may not have noticed it yet, but sodamakers are working hard to get you off your couch. 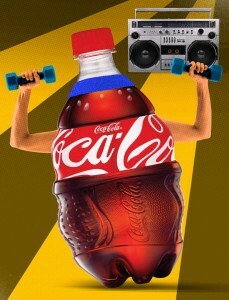 On Aug. 9, a New York Times article revealed that Coca-Cola was quietly funding a group of scientists called Global Energy Balance Network that emphasizes the role of exercise, as opposed to diet, in fighting obesity. There’s also Mixify, an advertising and social-media campaign launched by Coca-Cola, Dr Pepper, Pepsi and the American Beverage Association that suggests “mixing lazy days with something light, following sweaty workouts with whatever you’re craving”–encouraging the idea that when you’re active, you can afford to eat or drink whatever you like. This has some nutrition and obesity experts charging soda companies, whose sales of carbonated soft drinks have hit a 20-year low, with cherry-picking science to make its products more appealing. “The notion that we can exercise away a bad diet is absolutely unfounded,” says Dr. David Ludwig, director of the Obesity Prevention Center at Boston Children’s Hospital and professor of pediatrics and nutrition at Harvard, “and it’s contradicted by many research studies.” Indeed, there isn’t strong evidence to show that exercise alone–at least at the level that anyone other than a marathoner maintains–can help people shed pounds and keep them off.